Google has revolutionized how to search for cheap airfare. While living in Europe, I found a decent search engine to be my absolute go-to for searching cheap flights, “everywhere” in Europe. However, there wasn’t a tried-and-true counterpart for the US or … world….until now. I have been using Google Flights for some time now after having moved back to the US but only recently did I learn that I was still missing out on some GEMS of tricks so I’m going to show them to you here in the most easy/illustrative way possible so that you too satisfy all your wanderlust adventures without blowing the budget. So you know where you want to go and when you want to go? Simply type in “google flights” into your search engine or go to www.google.com/flights. Here, you can input your desired dates and cities, even down to TIME which is crucial for those Friday night post-work flights. Per the usual, you can select round trip, one way or multi-city and even see the lowest prices for each class of airfare should you choose to splurge for a first class deal! The listing presented provides you the best prices in increasing order that google can find based on your customized search criteria. Once your outbound and return flights have been selected, rather than google booking flights for you and charging a service fee, google simply directs you to the website where the airfare was found. How easy was that?! So what if you know when you want to go but you don’t know WHERE you want to go? Google has an awesome “I’m feeling Lucky” feature. 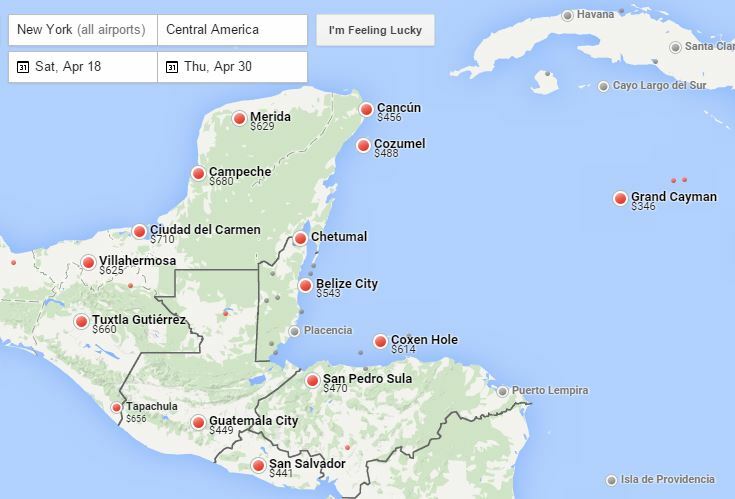 On the main page of Google Flights, select the map. From the map page, enter in your departure airport. You will then be able to see a listing of major cities and the related prices to get there. Are you feeling lucky? Click the “I’m feeling lucky” button next to the destination box. 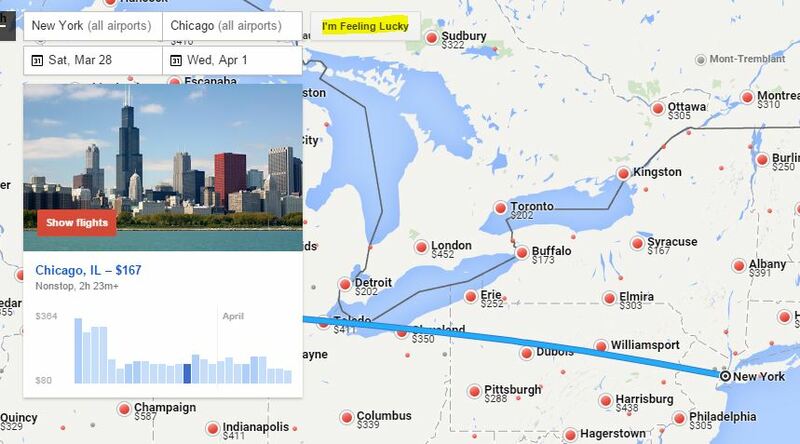 Google will suggest a flight deal based on your departure city. Pretty cool right?! You’ll also see a diagram underneath your selected city that indicates which days may be cheaper to fly on should you be so flexible. A similar option is to simply type in a region into your destination field, such as “Germany” or “Central America” in the destination field. For example, if I’m in the mood for a tropical vacay in Central America, I can see that I can save almost$100 or $200 by going to the Grand Cayman Islands rather than Cozumel or Belize, respectively. Further, by clicking on the destination, you can quickly see how long the flight is and the number of stops it makes. My cheaper Grand Cayman flight is direct and just under 4 hours; whereas, my Belize and Cozumel options make one stop and are significantly longer. Of course, by customizing your search, you can eliminate any unwanted flights. so, who wants to go to the Grand Cayman islands?! If you want to expand your travel options even more, simply expand or drag your map around to another part of the world. Gosh, I love technology! For those who are on the fence about a flight, simply save your travel search and google will send you an email if prices begin to fluctuate. And to think your wanderlust couldn’t get any worse? This entry was posted in Flying Tips & Tricks, Travel and tagged airfare, Airline, airlines, business class, cheap, cheap flights, cost, decent search engine, economy, flight cost, flights, Google, I'm feeling lucky, search engine. Bookmark the permalink.